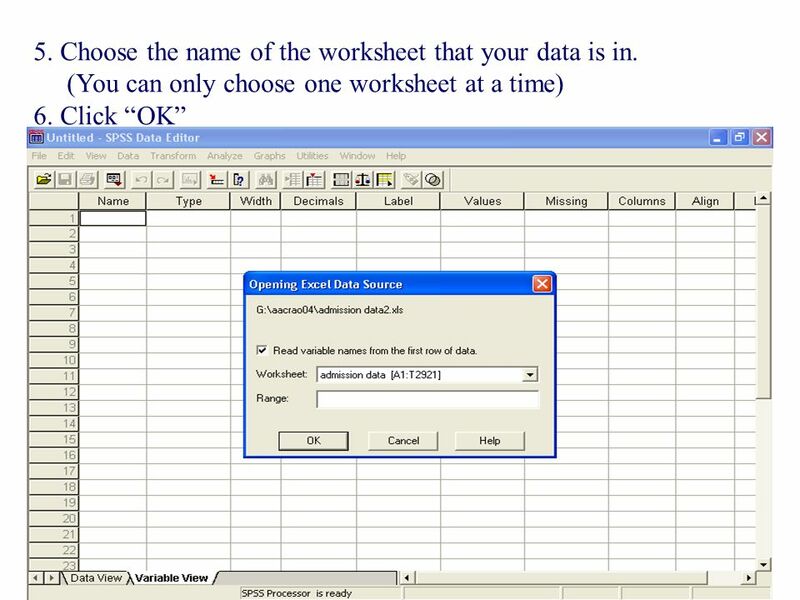 4 What can you do with SPSS? 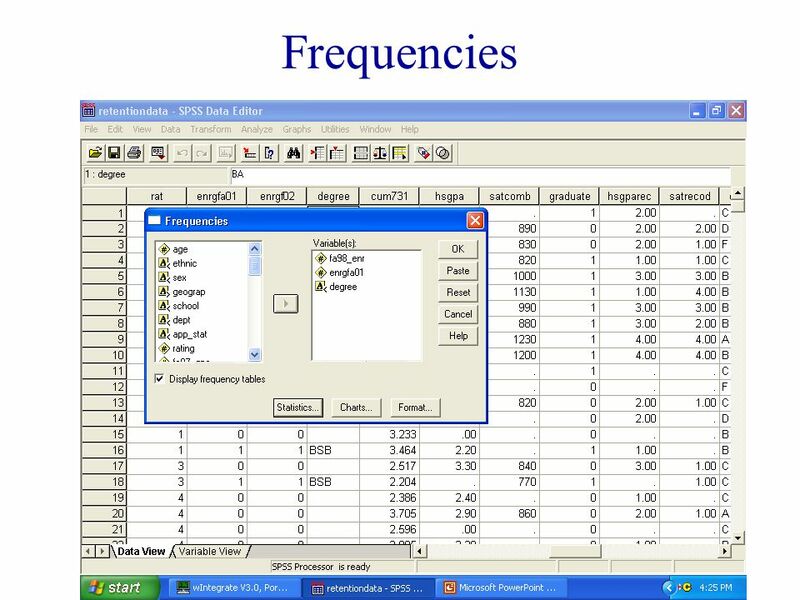 Run Frequencies Calculate Descriptive Statistics Compare Means Conduct Cross-Tabulations Recode Data Create Graphs and Charts Do T-Tests Conduct ANOVAs Run Various Type of Regressions And Much More! 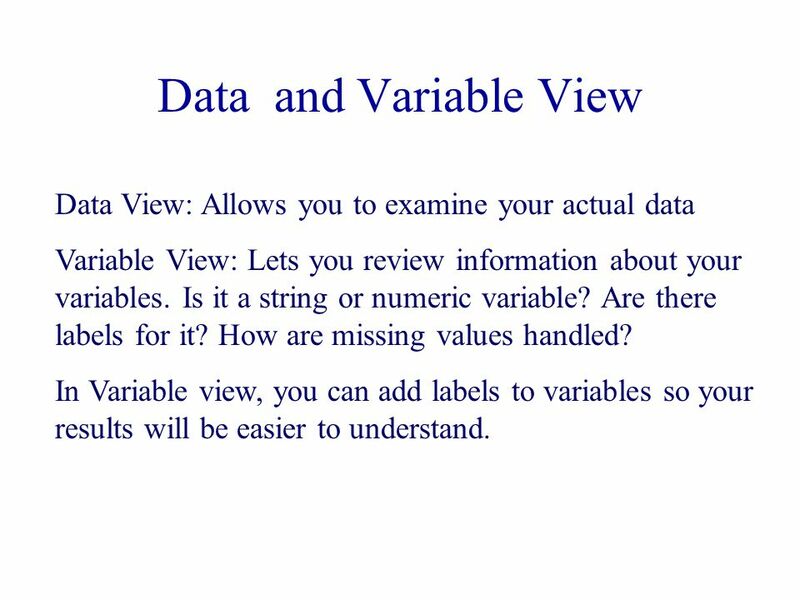 10 Data and Variable View Data View: Allows you to examine your actual data Variable View: Lets you review information about your variables. Is it a string or numeric variable? Are there labels for it? How are missing values handled? 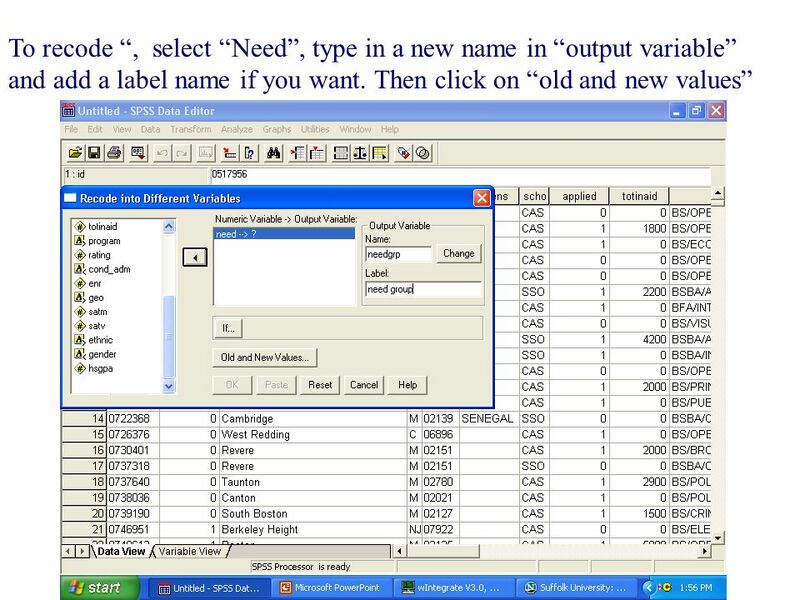 In Variable view, you can add labels to variables so your results will be easier to understand. 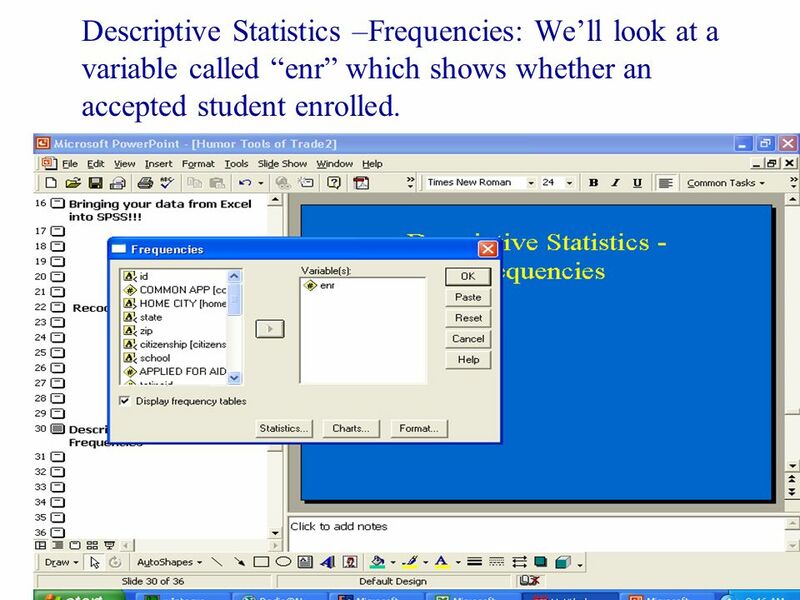 12 Descriptive Statistics –Frequencies: We’ll look at a variable called “enr” which shows whether an accepted student enrolled. 13 This is what the output looks like. About 26% of the accepted freshmen actually enrolled. 14 What else can you do with “Frequencies”? 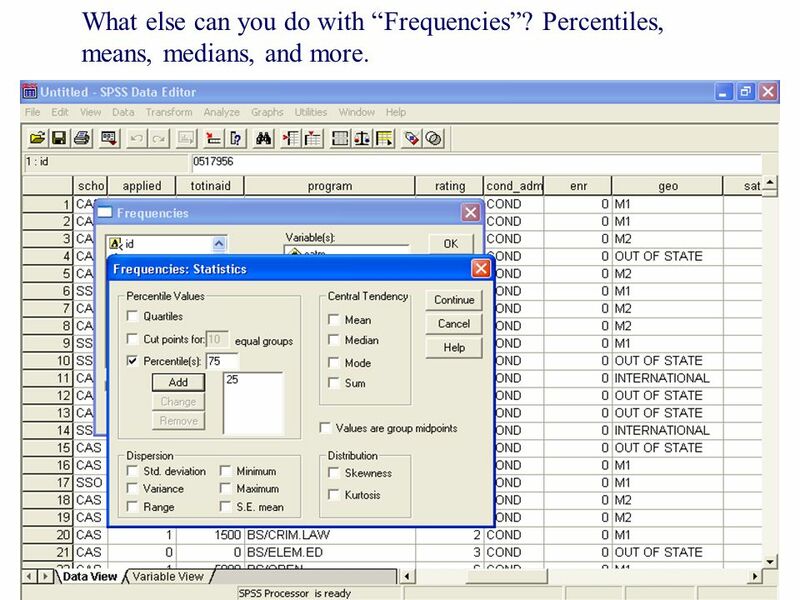 Percentiles, means, medians, and more. 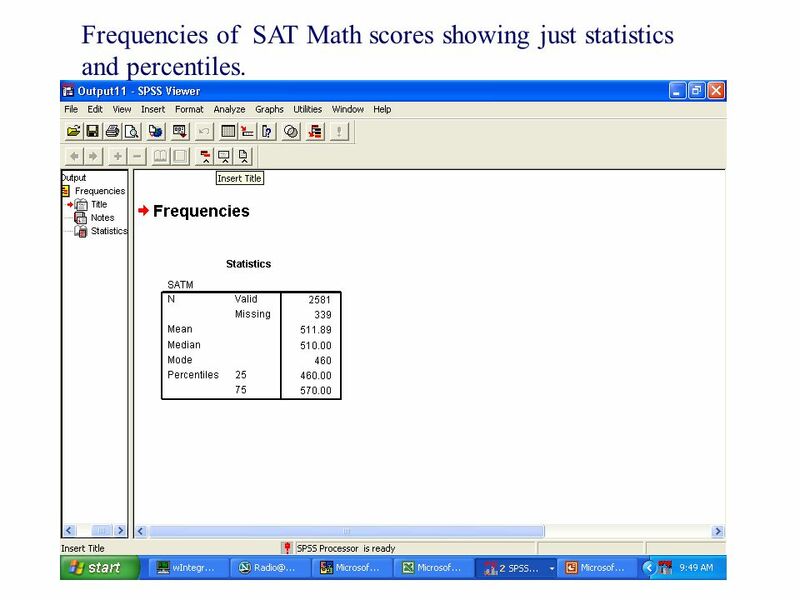 15 Frequencies of SAT Math scores showing just statistics and percentiles. 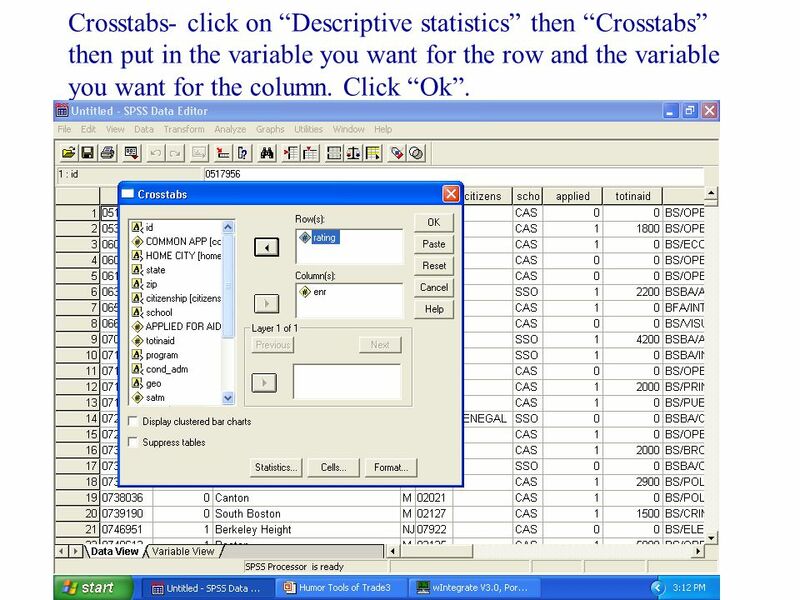 17 Crosstabs- click on “Descriptive statistics” then “Crosstabs” then put in the variable you want for the row and the variable you want for the column. Click “Ok”. 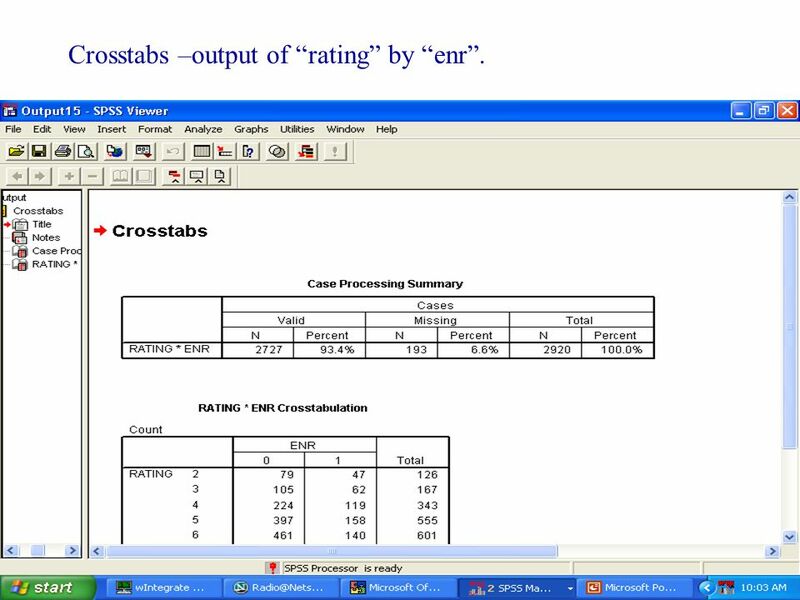 18 Crosstabs –output of “rating” by “enr”. 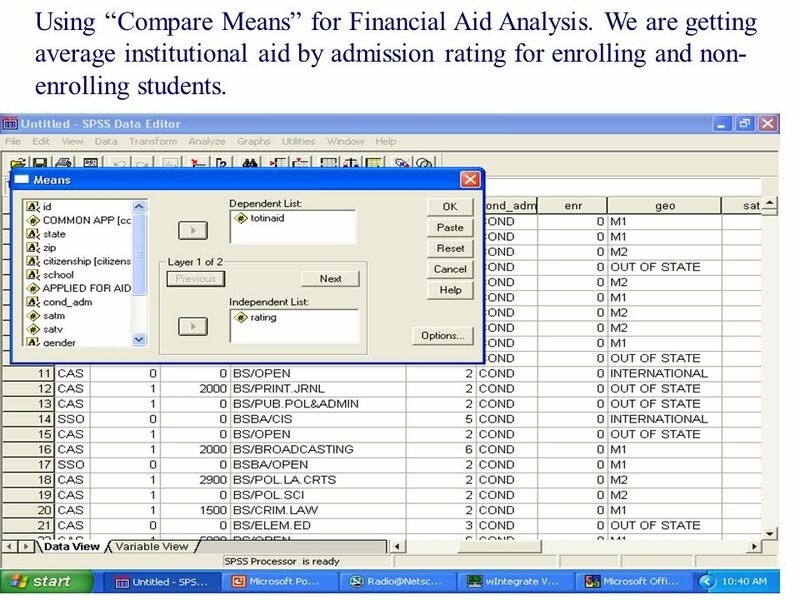 22 Using “Compare Means” for Financial Aid Analysis. We are getting average institutional aid by admission rating for enrolling and non- enrolling students. 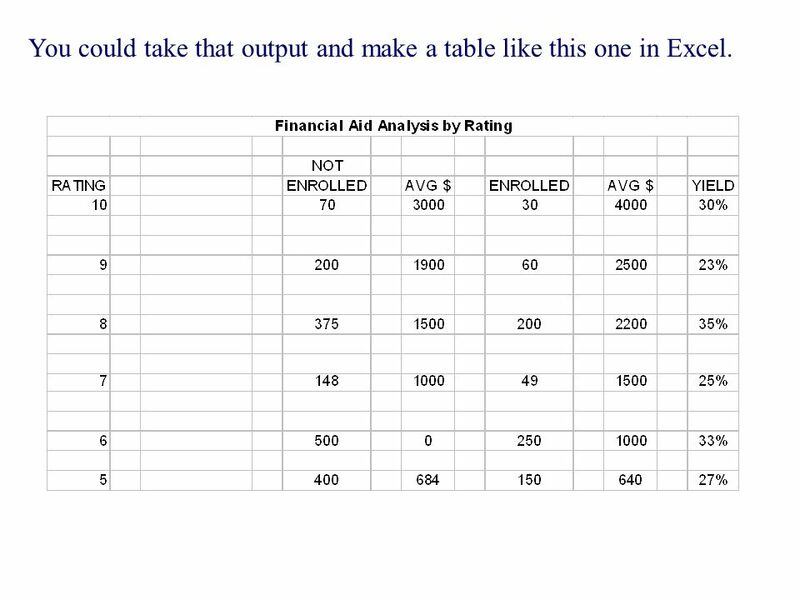 24 You could take that output and make a table like this one in Excel. 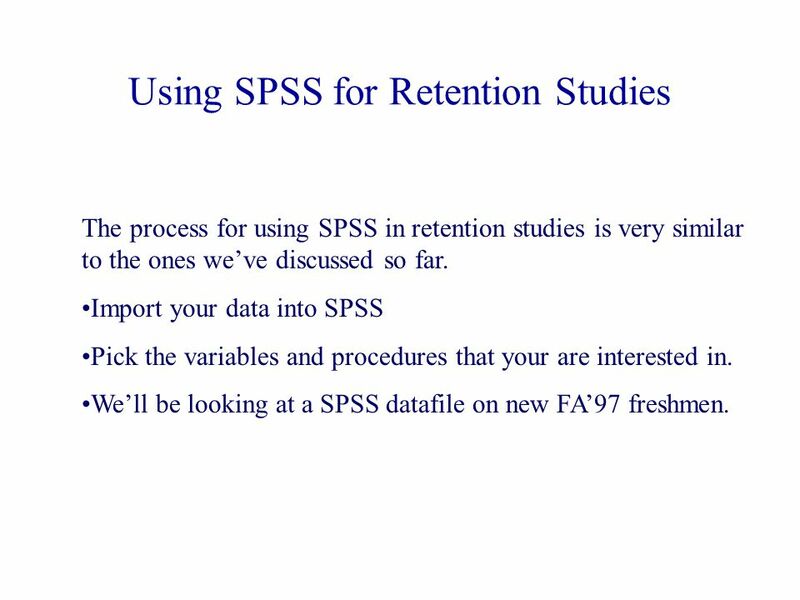 30 Using SPSS for Retention Studies The process for using SPSS in retention studies is very similar to the ones we’ve discussed so far. 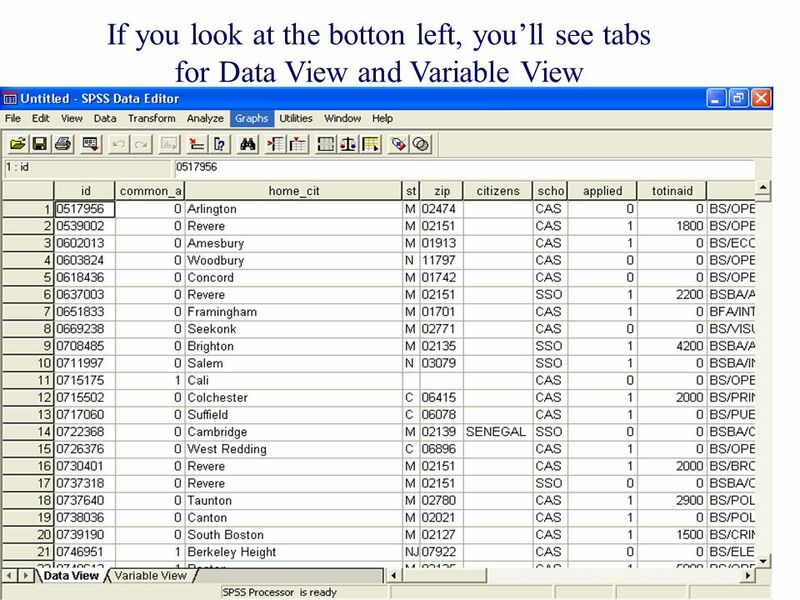 Import your data into SPSS Pick the variables and procedures that your are interested in. 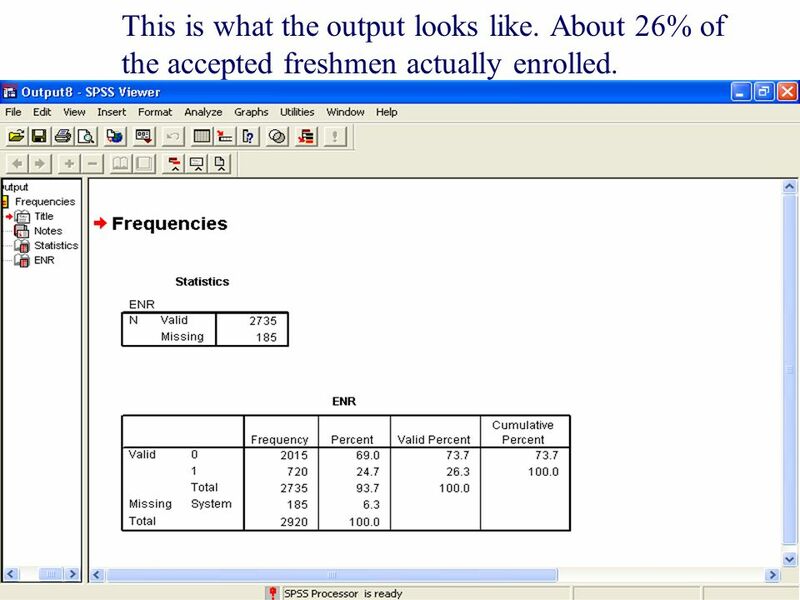 We’ll be looking at a SPSS datafile on new FA’97 freshmen. 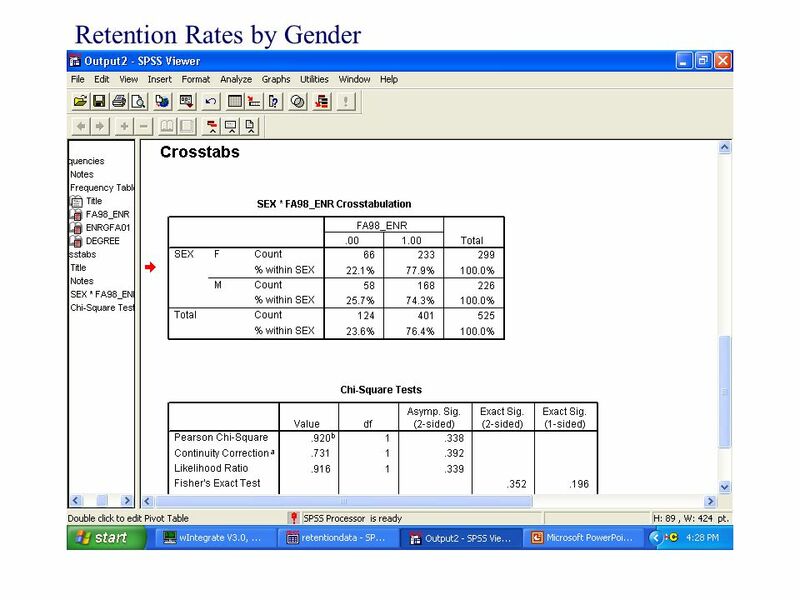 31 Retention: Procedures: Frequency – can tell in one “click” percent of students that were retained or have graduated Cross-tabs – can compare retention or graduation rates for different groups of students. For example, by gender, race/ethnicity, rating, and so forth. 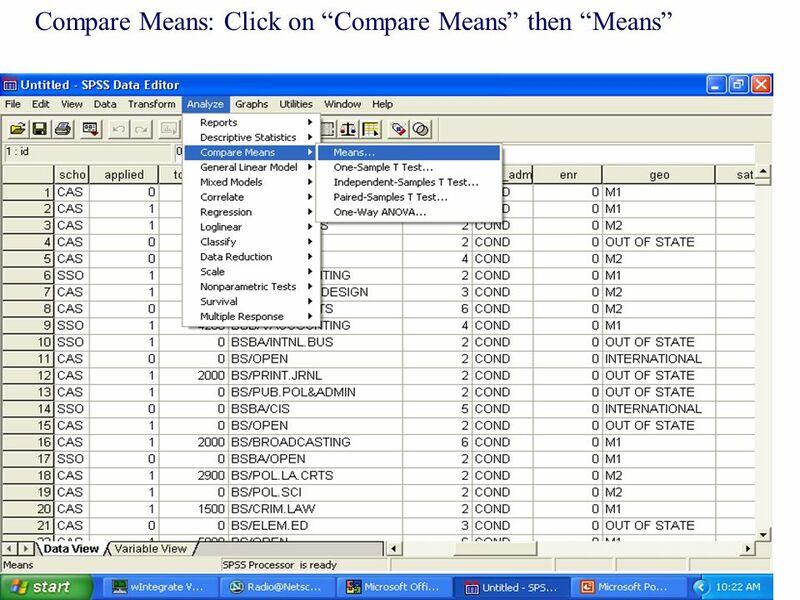 Of course, you need to have the data available from your student information system to do any of these analyses. 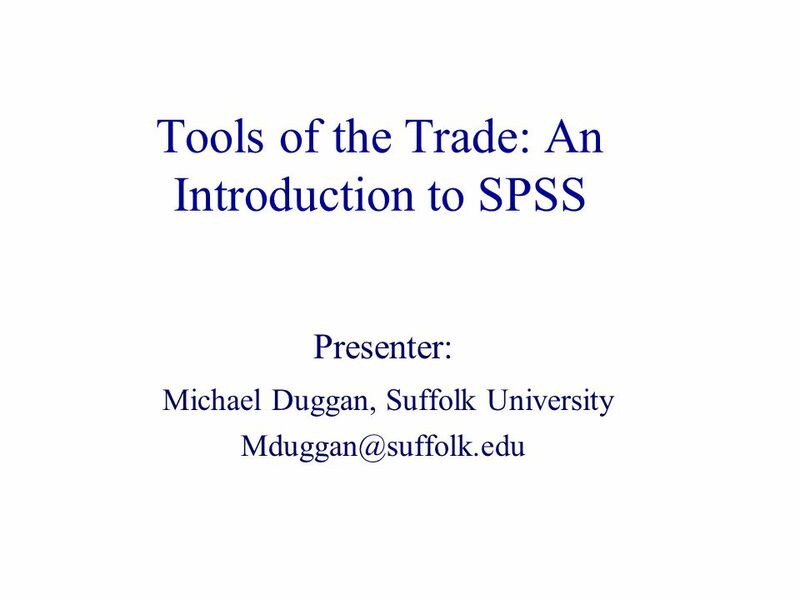 Download ppt "Tools of the Trade: An Introduction to SPSS Presenter: Michael Duggan, Suffolk University"
Tabulating Survey Results in Excel using EZAnalyze Paul Pope Extension Program Specialist – Evaluation Leader – Evaluation & Accountability Collaborative. 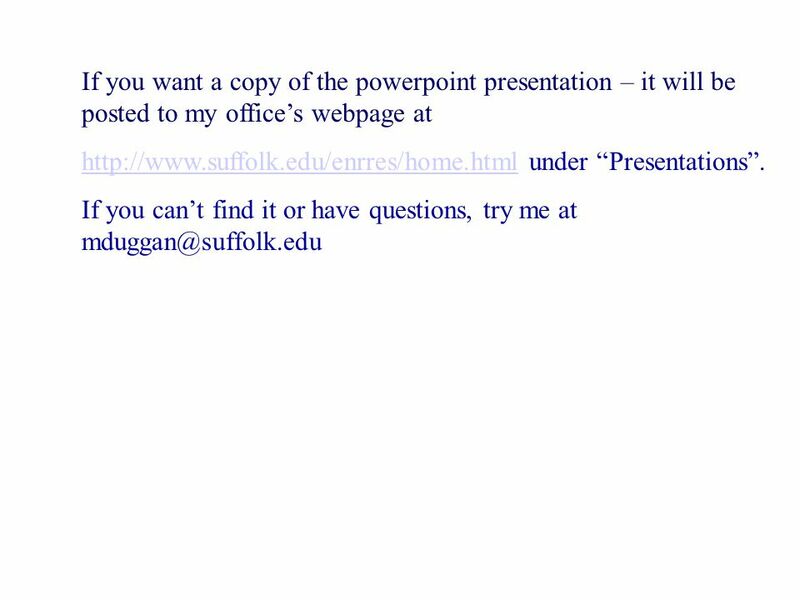 Social Network Analysis UCINET. 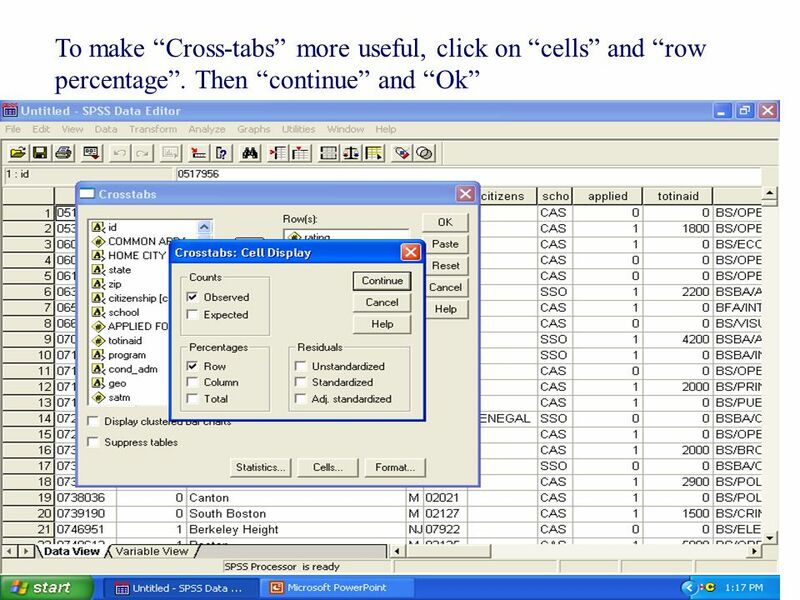 UCINET--Introduction UCINET—UCINET is produced by Analytic Technologies. It offers a very user-friendly, reasonably priced. 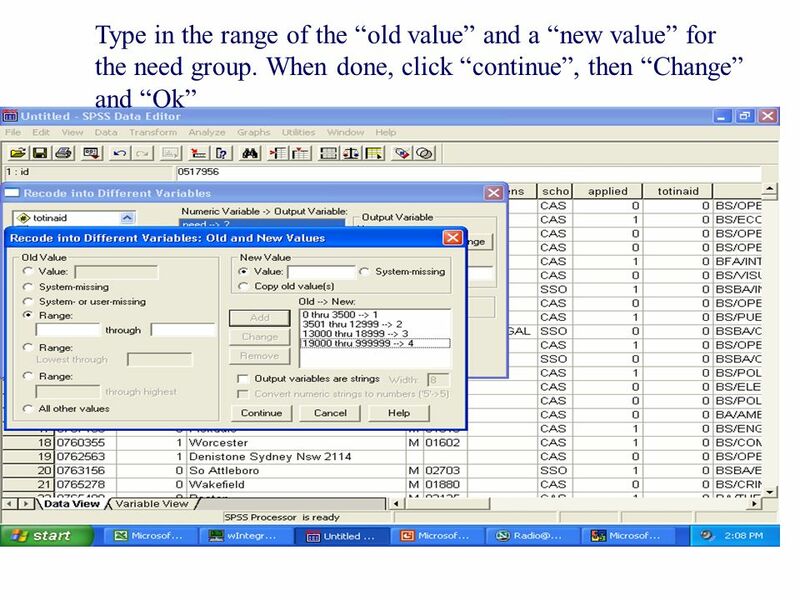 SPSS Session 5: Association between Nominal Variables Using Chi-Square Statistic. 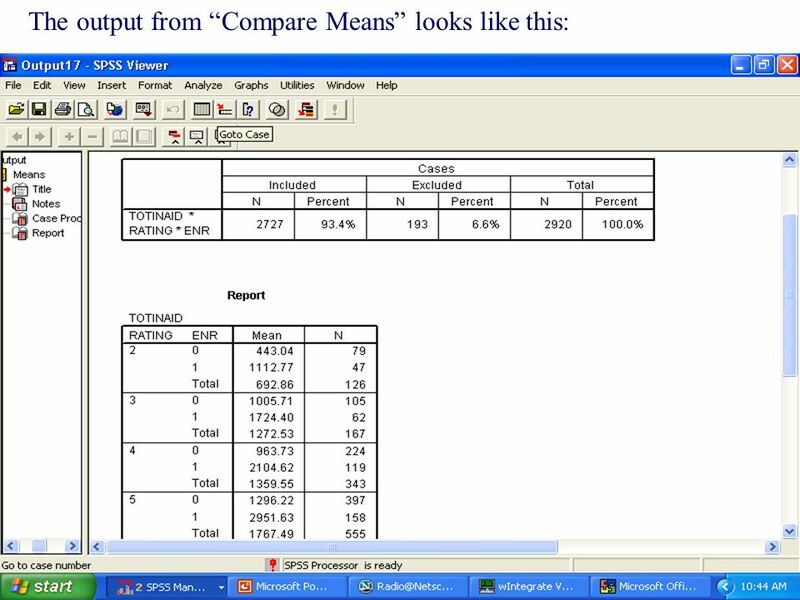 ©2004, 2006, 2008 UIW Department of Instructional Technology Meat and Potatoes SPSS Presented by Terence Peak. 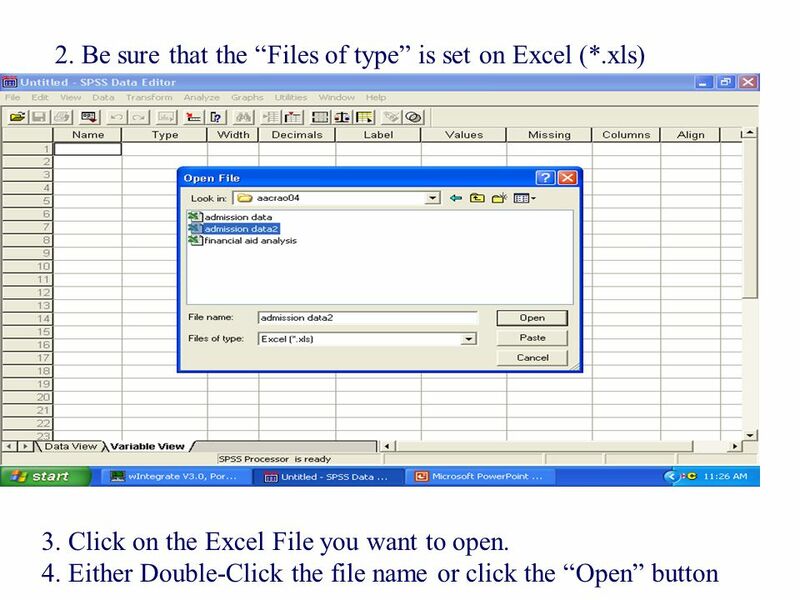 1 Using Excel for Statistics Office 2010 and 2013. 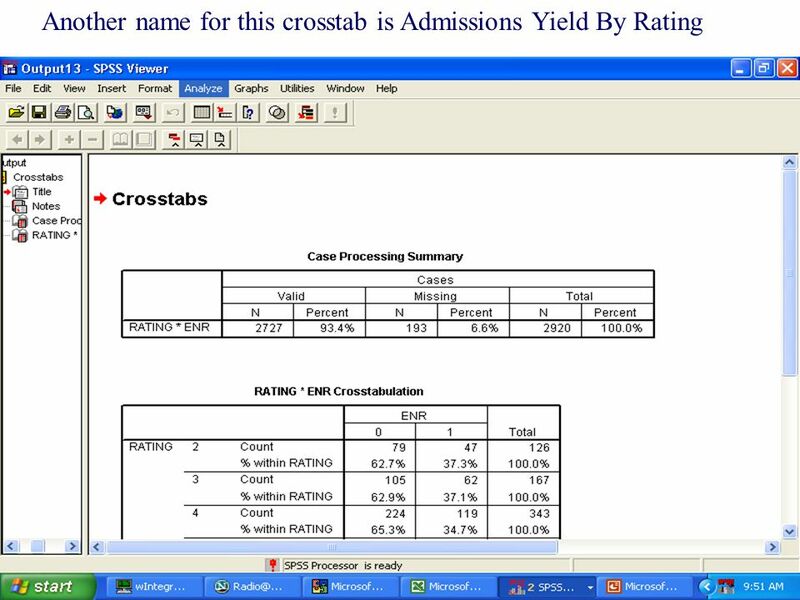 Bivariate Analysis Cross-tabulation and chi-square. 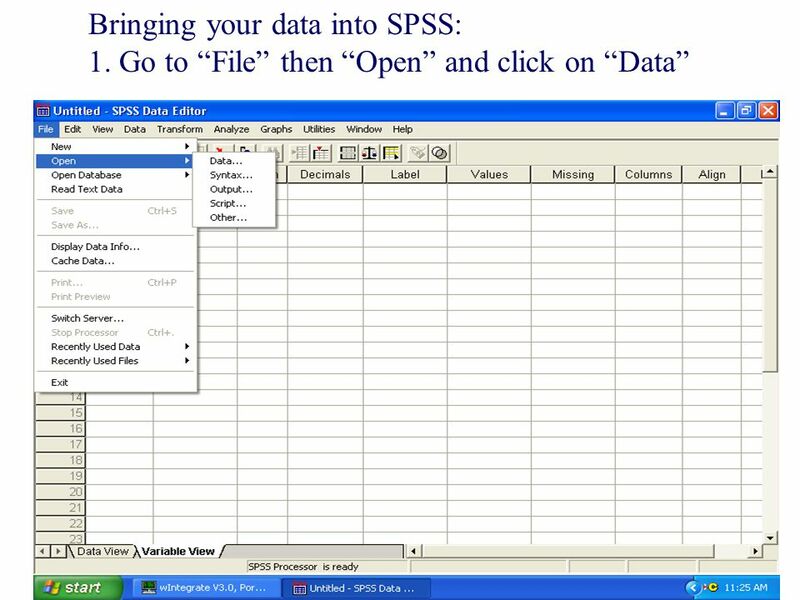 By Wendiann Sethi Spring  The second stages of using SPSS is data analysis. 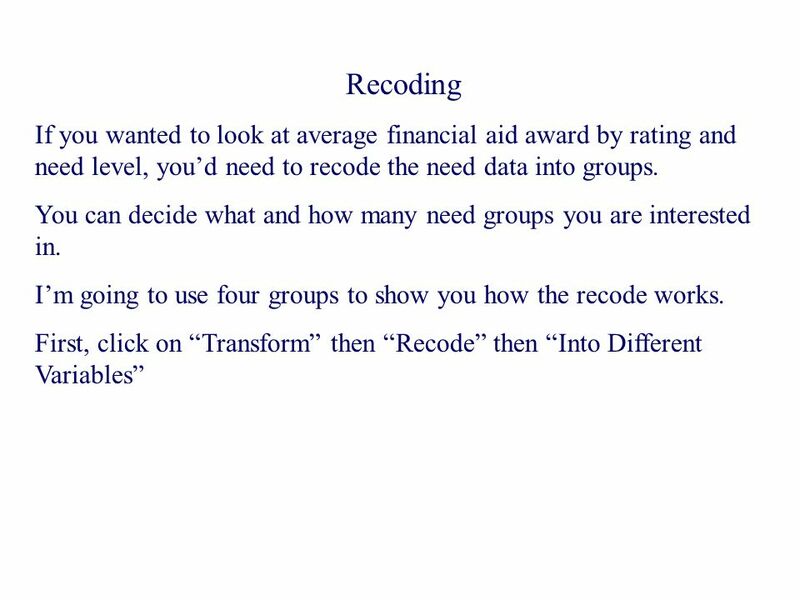 We will review descriptive statistics and then move onto other methods. AVP for Institutional Effectiveness and Director of IR Muriel Lopez-Wagner Assistant Director Tanner Carollo Institutional Effectiveness Associate Joanna. 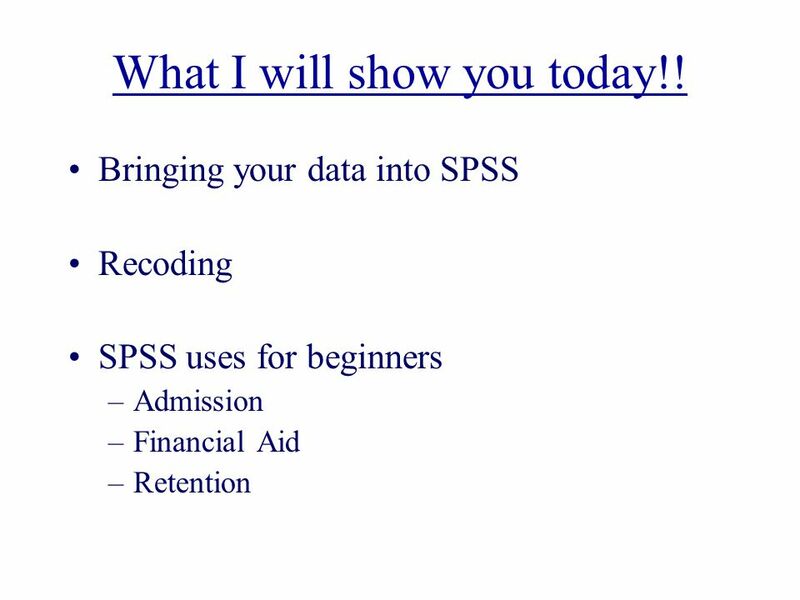 1 An Introduction to IBM SPSS PSY450 Experimental Psychology Dr. Dwight Hennessy. PSY 340 Statistics for the Social Sciences Chi-Squared Test of Independence Statistics for the Social Sciences Psychology 340 Spring 2010. 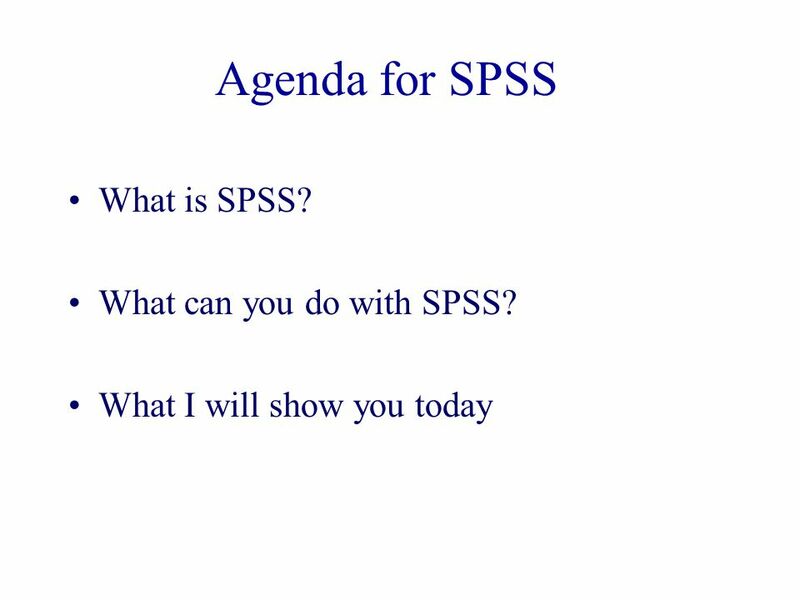 LSP 121 Week 2 Intro to Statistics and SPSS/PASW. 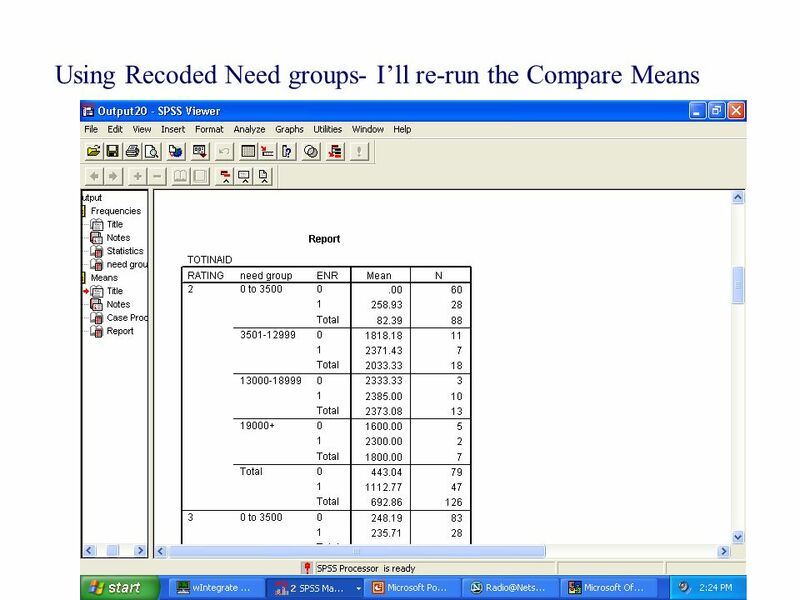 QM Spring 2002 Business Statistics SPSS: A Summary & Review. 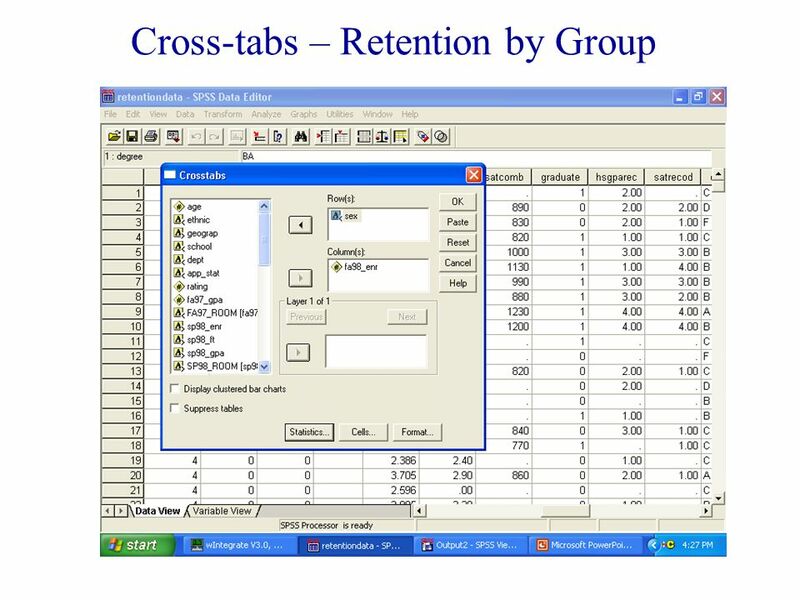 1 SPSS Recently it has gone through a name change so your icon on your computer may be under a different name (i.e. 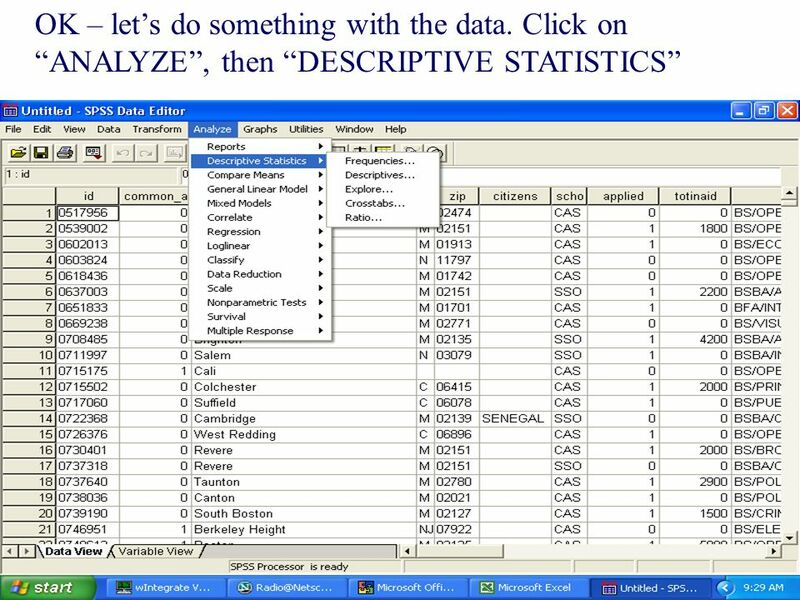 PASW- Predictive Analytics SoftWare). 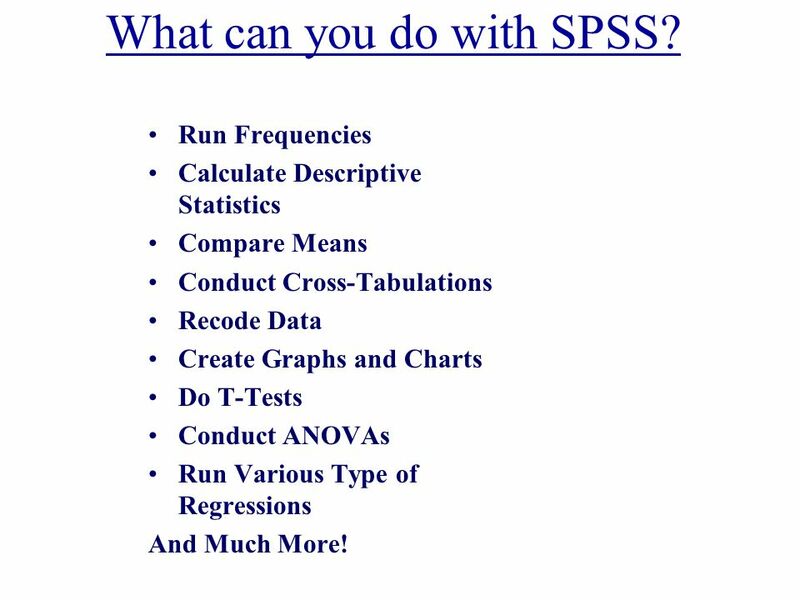 LSP 121 Intro to Statistics and SPSS. 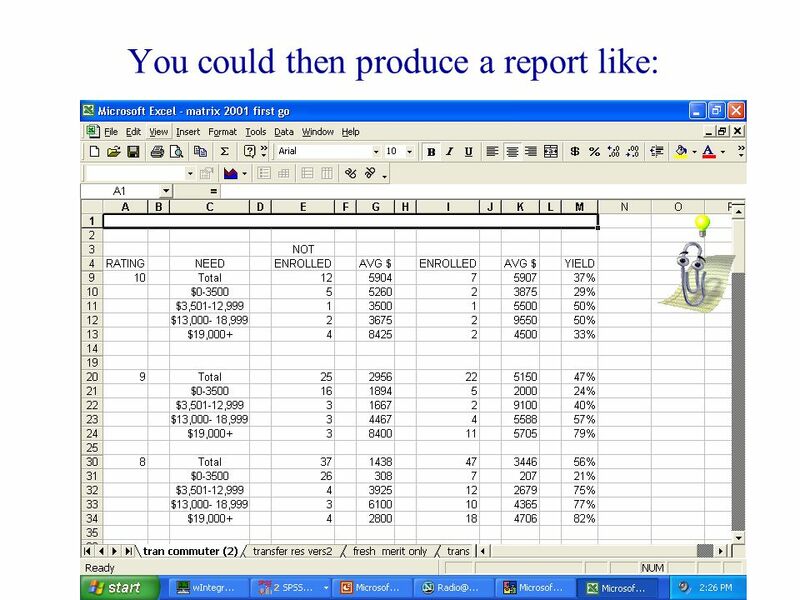 Statistics One of many definitions: The mathematics of collecting and analyzing data to draw conclusions and make. 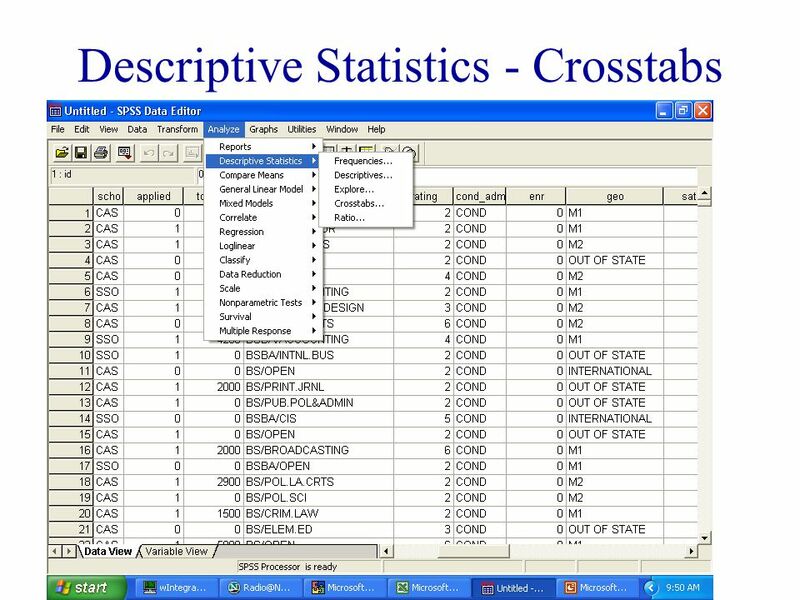 Introduction to SPSS Descriptive Statistics. 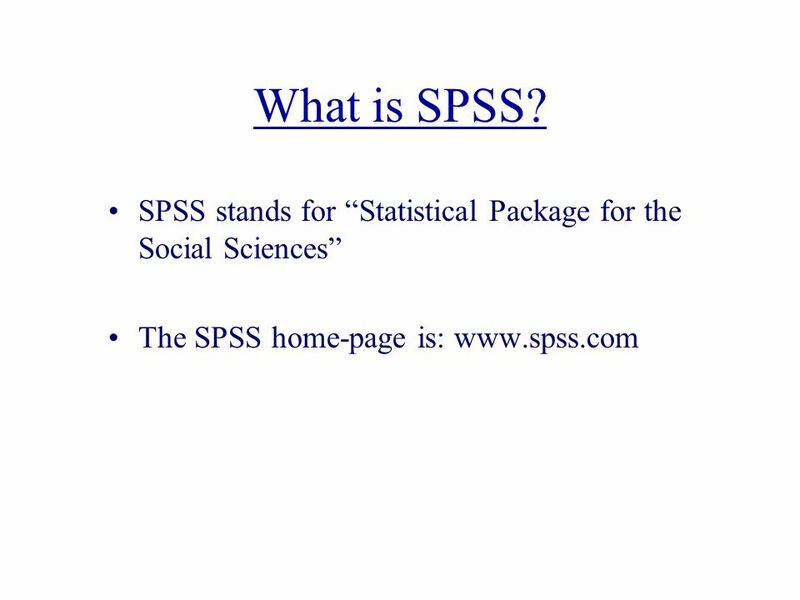 Introduction to SPSS Statistics Program for the Social Sciences (SPSS) Commonly used statistical software.